As I do my regular sort of the pantry, I always try to place literary foods together by type. It’s often good to know what I’m going to eat before I put it into my mouth, after all! Once in a while, though, I find something new. Well, maybe not new precisely, but new to me. Today, we have one of those things: an acid Western. It’s a genre I’ve never heard of so, needless to say, I was anxious to dig in and find out about it! So it may sound strange, but at the end of this treat, I don’t have much more of an idea of what separates an acid Western from any of a number of other Westerns I have read. However, that does not mean that Devils is a bad book, or even an average book. Oh no, this slice of literary pie is truly wonderful. Yes, the cat’s out of the bag early this time, but let’s give the chef her due and touch on why it is such a tasty treat. Devils drips, no, gushes with style. Every scene fits the dramatic whole and pushes forward the central themes of the book and does so in a semi-mystical trance, leaving the reader to decide what is truth and what is illusion along with the nameless protagonist. Told through journals and letters, the book provides a razor focus on the travels of our protagonist who, despite the lack of a name, lacks not at all in the characterization department. In fact, one could argue the lack of names for the protagonist and several other major recurring characters lends more to their characters than if they had them. Their nameless quality cuts through preconception and lets each stand in a certain archetypical fashion, while each retains strangely distinct qualities, something often lost in books with strong archetypes as characters. The overall tone is dark and driving, focusing greatly on the evils that men do. It doesn’t shy away from anything and so it may dip into being too dark or horrific for some tender-stomached readers. However, Devils is never lurid or exploitative; its gore and terror are, despite the mysticism that roils off the page, far too grounded in reality to be such. Unlike some chefs, diFrancesco handles it with aplomb, dishing out the necessary horror without overfilling to the point of ridiculousness. The plot is perfect. The pacing is constant, ebbing and flowing naturally like a country stream, but never abating. As I said above, ever scene fits into the larger puzzle and, by the end, the reader will wind up satisfied by the conclusion and yet filled with the inevitable sense of fate, as if it could have ended no other way. It was a meal I couldn’t put down until I had finished. 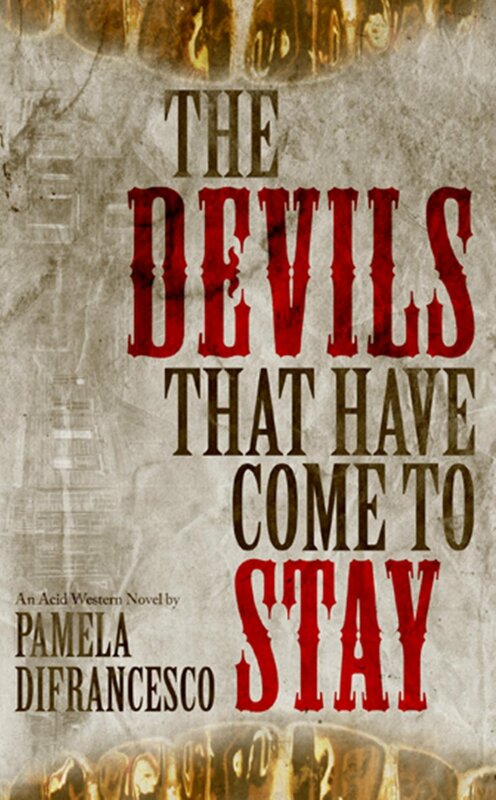 So, fellow literary foodies, while I still do not know what an acid Western is, The Devils That Have Come To Stay is a fantastic literary feast, filled with dark images, creeping horrors, and flavored with the timeless spices of the American West. If you like Westerns or not, I could consider this a must-read volume, only to be strayed from if you don’t have a strong stomach. ← General News: Starving Review Requests Closed Once More!